Rockstar Games has been courting a lot of controversy in the past few months, with most of the attention placed on GTA3 which has really pushed the envelope. Lost in the hype has been another exceptional title, Max Payne, which received good notices upon its release on the PC last year. The Laser looks at the recently released Xbox edition of the game and finds out if it lives up to its reputation. While it hasn’t exactly gone unnoticed, this title has received surprisingly little heat despite its excellent production values. Rockstar’s impressive Max Payne imerses players into the underworld of organized crime, corruption and violence that’s unlike anything seen on a console before. This seems to be a straight port to the Xbox, which is disappointing on some levels, but still makes this a solid entry in the console race. Maybe it doesn’t stretch the hardware to its limits, but there are some features, such as auto-saving to the console’s hard drive, no installation hassles and a decent control scheme that compensates for this nicely. As you may have guessed, this isn’t a game for younger players, but older gamers who are ready will find this an outstanding experience. 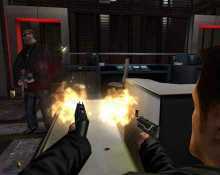 Max Payne casts the gamer as a renegade cop out to avenge the death of his family, which is told in the game’s elaborate opening setup sequence. The sophisticated plot is closely tied into the game itself, making it resemble a film-noir gangster movie with incredible action sequences. Fortunately, this is no interactive movie, instead it seamlessly interweaves cinematic and interactive 3D sequences to create a believable and convincing world. While the individual elements may seem a bit pedestrian, the complete package is much greater than the sum of its parts. The most glaring thing about the title is the writing, which is several steps beyond the usual juvenile, predictable pace. Max Payne is a long and involving title but keeps the momentum, and players’ interest alive thanks to its exceptionally well done scripting. Instead of unfolding predictably, Max Payne instead opts for a novel’s pace and structure. This allows the player to become fully versed in an elaborate backstory, and also gives the script breathing room. The language is surprisingly sophisticated, though it does occasionally get bogged down in pot-boiler clichés. What’s most impressive is that the storyline has been so fully integrated with the story. So while levels can be difficult, there are plenty of plot twists, surprises and challenges for Payne. Each one also seems to be divided into chapters, each with multiple objectives to complete making MP an impressively full-bodied game where you can tell a lot of though has gone into each element, making for a consistent world throughout. Thankfully, the closely spaced save points means Max Payne suffers little from the typical frustration. The story gives you plenty of motivation and the game is quite addictive. Max Payne adjusts its difficulty to the player’s skill level, making things easier or harder depending on how you’re doing. Adding realism and challenge, each level requires a good mixture of skill and thought to complete with puzzles and more facing players. The AI is quite sophisticated as well and this means that enemies are incredibly dangerous and much smarter than players are used to. They attack in groups for the most part, though occasionally one or more stays behind from the main group as a nasty surprise. They enemies you face react to your movements, which means they can duck out of the way, hide from behind a closed door. What’s cool about this is that the environments can trick the player into believing their alone, only to face sniper attacks. The enemies are smart enough to anticipate your moves, and seem to be able to hear your footsteps which adds to the sense of immediate danger throughout the game. You never really feel completely safe, and its this edge that makes things so engaging. Payne’s urban feel is enhanced by dark, moody visuals that effectively capture a bleak atmosphere which feels as foreboding in its realism as many monster titles do in their fantasy realms. Max Payne’s environmental effects such as snow are pulled off flawlessly. The intense snowstorm gripping the city plays a large role in the atmosphere, lending Max Payne a strong sense of paranoia and claustrophobia throughout. This is obviously used to tremendous effect to keep the player constantly alert. These effects mix with the architecture of the buildings to truly create what feels like a living, breathing city. The modeling suspends disbelief effectively with believable movements and responses giving the characters an incredibly realistic appearance. You can tell a lot about the characters from their body movements, such as the cowering drug addicts hiding in corners, the bold fearless attacks of the mafia and the confidence of Max Payne himself all lend a fantastic sense of realism to what is an intense experience. Max Payne’s heavily promoted Bullet Time effect is astonishing and is unlike anything else seen in a game before. What’s really cool is that it plays a large part during the game itself; Bullet Time has been used to some extent in other titles (mostly sports) but it’s always used in replays. The ability to manipulate time makes all the difference giving the action sequences an incredible look that evokes The Matrix crossed with John Woo. The production values are only enhanced by the voice-acting which brings life to the characters and make them fully fleshed-out. Payne himself is fleshed out superbly and is a cynical but surprisingly sympathetic protagonist. The dialogue is surprisingly sophisticated for a game with the excellent writing making this something quite out of the ordinary. While some people may be shocked initially by some of the more graphic and violent portions, it must be pointed out that this doesn’t seem to be done out of shock value alone and is instead an integral part of the action. In fact, Max Payne would be a far less impressive title without it for the simple reason that it wouldn’t seem as realistic or authentic. Obviously, a video game can’t be entirely realistic or it wouldn’t be fun. For example, ammo is easy to find and there’s a good supply of pain-killers involved, which gives Max more than the allotment of lives he would have in real-life. While it would be hard to gain access to much of an arsenal in real life, there are many weapons available including dual machine guns, shotguns, Molotov cocktails and grenades. Obviously, not realistic, but the selection makes the game all the more fun and addictive. This is all impressive but Max Payne’s signature feature is that infamous bullet time feature where the action slows down thus allowing him to dodge enemy bullets and fire at them with greater accuracy in highly dramatic sequences. This is as easy to put into effect as pushing a shift button, but can be quite effective when faced with a group of particularly intractable enemies which need to be taken down with minimal damage to yourself. This attack mode is time-limited and should be saved for really difficult battles. What’s really impressive about Max Payne is the attention to detail that has gone into its weapons, including bullets have been realistically modeled to the point that each gun has a unique feel and response. Each of the weapons has also been realistically modeled, giving their appearance a realistic feel. One issue that may have come up is how well a title developed originally for the PC would fare on console. Max Payne seems, in some way, better suited to console. It’s basically a single player game, which lends itself much better for solitary play, and while there’s doubtlessly going to be some degradation in the quality of the visuals making the leap from VGA to standard televisions, Max Payne still looks razor sharp. The interface on the console, far from being the awkward mess many had feared works well. Using a third person perspective helps immeasurably and the game’s camera issues are minimal, with very good angles implemeneted throughout. The Xbox controller is utilized effectively and makes playing Max Payne simple while allowing for complicated maneuvers on standard configuration, there are some customization modes, but the default method is so excellent, most players shouldn’t feel the need to do this. You move and adjust the camera simultaneously using the 2 analog controllers shooting and implementing the bullet time is a breeze. The only problem encountered came when it was time to pick up health power-ups, it wasn’t initially clear how to use these, but it turned out to be a simple press of a button, which made playing that much easier. Additionally, the interface made switching between weapons, getting into bullet-time mode and moving about is intuitive and easy thanks to the straightforward design which enhances the overall feel of the experience. There are some things which unfortunately detract from the game – the major one being that for the most part, the cut scenes basically consist of static pictures with voice-overs. This is a bit disappointing and does somewhat diminish what is an otherwise fantastic game. It’s probably more due to budgetary constraints than anything else, and does redeem itself by lending a greater amount of wordiness and intelligence to the plot. Obviously, Max Payne is not intended or even aimed at children, so parents should keep that in mind and so should the usual array of censors and watchdogs. There’s an M rating on the box and its definitely appropriate. The gutsy developers at Rockstar deserves additional credit for not compromising on this game’s content to earn a lower rating and more sales. Still, the accomplishment of Max Payne is that its one of the first truly adult games out there that actually seems targeted towards mature gamers. The extreme violence and adult topics include prostitution, drugs and corruption makes for a plot that doesn’t condescend in the slightest. Max Payne’s storyline resembles The Sopranos and Goodfellas with its bleak, existential tone but is still quite engaging and leagues more interesting than the usual clichéd plotting in games.. The characters here actually resemble real human beings, which helps keep the players interest-level high throughout Max Payne’s storyline. It isn’t all shock value and sophisticated writing however, because the game underneath is top-notch being quite addictive and also quite a bit of fun. Max Payne is a brilliantly conceived and implemented game that seems to deliver on the promise of electronic games becoming a great storytelling medium. While some may not accept this idea yet, Max Payne has gone a long way towards this with outstanding production values that immerse players into the game. All this and superb gameplay make this a bit of a sleeper but one that shouldn’t be overlooked by adult gamers.